Remember when I left y'all hanging on Friday when I said I had a fun giveaway announcement?! Well, I'm here to share that with you today. I don't typically post on the weekends, so you know this has to be legit. The giveaways will be posted starting December 13 and will end on December 24th. 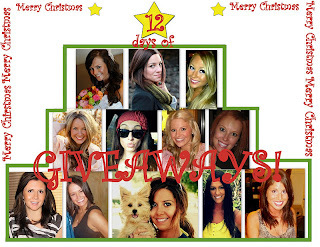 Each blogger has their own specific day to do their giveaway so make sure you read their names and blog links below so you can enter them all of them! That's a chance to win 12 awesome giveaways. We will all be giving away something that describes us or where we live! If you have any questions or are not sure where to find a certain blogger, please leave me a comment or email me and I can send you in the right direction!! I hope you all are just as excited as I am for this! This is so great! Can't wait!